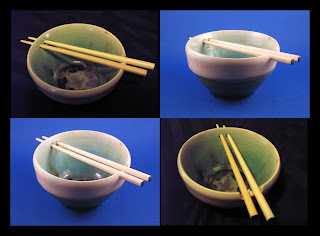 Chopsticks can be made of many different materials. In china, ivory chopsticks are very popular. In most of Asia, wooden chopsticks are the most commonly used chopsticks. In north America and Japan, disposable chopsticks are used more frequently. In Chinese restaurants, plastic ivory colored chopsticks are almost always used. In Korea however, uses thin metal chopsticks. and in Vietnam they use chopsticks made of a special kind of wood called rubber wood, and also bamboo. There are many kinds of chopsticks. I will talk about wooden chopsticks and plastic chopsticks. Plastic chopsticks are the best in my opinion. They are easy to clean and will not give splinters. Chopsticks that are made from wood can range from quality. Disposable chopsticks are the worst because they are made from wood and can cause splinters. Plastic Chopsticks are more expensive but so much more etiological. 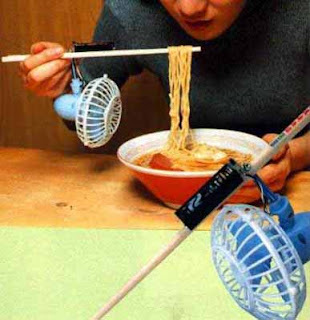 Here is a nifty Idea for Chopstick holders. Its a bowl with a chopstick holder! I find it always so annoying to have my chopsticks on the table. I sometimes have my chopsticks resting on top of the bowl and when i go grab them I knock them off. what a great idea having chopsticks in a bowl. This is the Chopstick Bra. Discovered and made in Japan on Nov 7. There was a convention to promote the use of non disposable chopsticks to prevent deforestation. I would use my Chopsticks to Chop on those with my Stick. My Chopstick blog is born! yes! Hello! I love chopsticks and I think they are one of the worlds most greatest inventions. They can be used in so many ways its insane! I cant wait to write about the diversity and intelligence of chopsticks. My name is Hanz and I will dedicate my self in letting the whole world know about the wonderfulness of chopsticks. If you would like to trade links with me, please E-mail me and I will add them asap.